Nothing says the holidays in New York City like the window displays on Fifth Avenue, the Winter Village in Bryant Park and the Rockefeller Center Christmas tree. The tree has been a holiday staple in Rockefeller Center every year since 1931, with the lighting being broadcast live around the world since 1951. This year, the annual Rockefeller Center Christmas tree lighting will be held on Wednesday, November 28. The tree's lights will be illuminated every day from 5:30 p.m.–11:30 p.m. through January 6, 2019, and 5:30 p.m.–9 p.m. on January 7, 2019. On Christmas Day, the Rockefeller Center Christmas Tree will be lit for a full 24 hours. The tree is 72 feet tall and weighs 12 tons. The 75-year-old Norway Spruce tree is named Shelby and hails from Wallkill, New York, which is 80 miles north of New York City. Shelby was donated by Shirley Figeuroa and Lissette Gutierrez. The tree will be wrapped in five miles of multi-colored lights and topped with a brand new star made of three million Swarovski crystals. After January 7 the tree will be donated to Habitat For Humanity. When is the Rockefeller Center tree lighting? 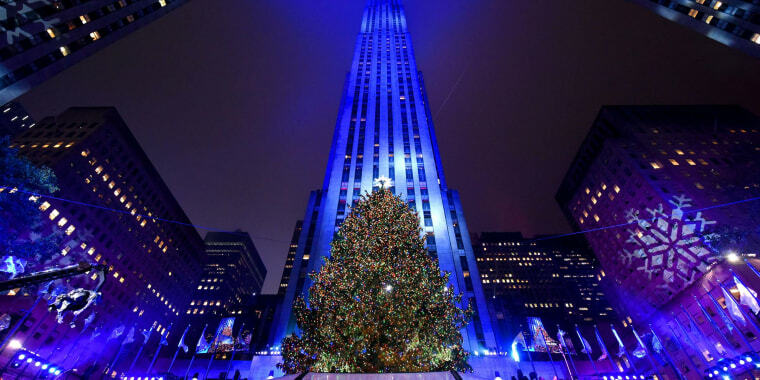 The Rockefeller Center tree lighting festivities start at 7 p.m. on Wednesday, November 28. However, the actual tree lighting will happen around 9 p.m., and the event is set to end at 10 p.m.
For those in New York hoping to watch live, spots are first-come, first-serve. Plan on arriving at Rockefeller Center around 3 p.m., but no later than 4 p.m., to secure a good view. How to watch the Rockefeller Center tree lighting? The 86th annual tree lighting will be broadcast nationally on NBC from 8 p.m-10 p.m EST. The holiday season kickoff event will be hosted by TODAY anchors Savannah Guthrie, Hoda Kotb, Al Roker and Craig Melvin. Be sure to tune in for Mario Lopez, Stefan Holt, and Natalie Pasquarella's pre-show at 7 p.m. EST on NBC. And if three hours of festivities weren't enough, stick around for Chrissy Teigen and John Legend's Christmas special, "A Legendary Christmas with John and Chrissy," which will air directly after the live tree lighting at 10 p.m. EST on NBC. For all the cord-cutters out there, you can stream the event at nbc.com/live and on the NBC app. It will also be broadcast on the NBC New York website. Who is performing at the Rockefeller tree lighting 2018? Already in the holiday spirit? For more stories about the holidays, gift ideas and more, sign up for our Stuff We Love newsletter.